Having rock that is full of holes because it is better for surface area for good bacteria to breed is a very good thing. And in the set up of new tanks that I've done, I always assumed (not a good thing) that there would be good holes where I could stick frag plugs. And that has never turned out to be the case for me. I've been close, but never enough. So I'm going to redo my now 6 month old 125g DT because I feel like half my tank is wasted space behind the rock island. I had the bright idea (well... I think it's bright) to drill 3/8th inch holes in the surface of rocks I intend to be exposed for coral placement. I started drilling some holes and found that having frag plugs just drop almost snugly in works really well, at least dry and on my workbench! I had some rock that does have a lot of natural holes but when I tried to test fit a frag plug it really didn't fit well, if at all. So I did a little drilling of the natural holes as well and now the frag plugs fit way better. I figure after 6 months the holes I don't use will have something in them. Maybe coraline, or micro stars, or who knows what! It's just an idea and I'll show what I did and the results in my build thread as I move forward. really good idea. I tend to stick reef putty into the almost-fits holes and stick the plug in---but this reckons without my dascyllus 3 stripe damsel, who will grab a piece and try to carry it off: if I don't wedge it really well, he'll free it. He's pretty, but he's a brat. If I put 2 pounds of rock per gallon, I would have zero room for anything. I bet my new 50 gallon won't even contain 15 pounds of rock. Depends on the rock. We have one rock in our freshwater that probably weighs 40 lbs on its own. it would be horrid for saltwater. Some of my dead coral has a negligible weight, light as a feather unless wet. The main thing is surface area---and porosity [micro-holes]. That is a FAR more reliable guide re the efficacy of the rock. The same way that human lungs, if truly flattened, would cover a football field, your rock needs to provide a lot of porosity. Somebody is bound to ask about the artificial expanded aluminum/ceramic blocks. I have one of these: I have run a PolyFilter strip to test for free aluminum and it is safe. It is also porous as a sponge. I would, because you need the sort of bacteria that lives deep in the dark, go for a block of this stuff rather than the small pieces. OTOH, it would not look very good in your typical tank, and while a sump can get flow through it, the typical in-tank situation, not so much. I also did not experience a nitrate reduction by using it (and I had a problem). I got the nitrate way down real fast, after using everything from ceramic rock to carbon dosing and several absorbent mediums---by getting a much better skimmer. Nitrate sank like a stone. Rock---can only do so much. Sometimes it needs help. Last edited by Sk8r; 02/05/2017 at 01:46 PM. Oh mine does. Pukani and Fiji mix. Then a couple liters of Matrix as well. At this point, I say use how much rock you want. There are so many ways to add surface area or increase bacteria. Hi Sk8r, you have written quite a few good articles including this one, but their are a couple things in this article that I would like to discuss with you. First, when you seed dead rock with a piece of live rock, the dead rock does not become a piece of live rock, yes the bacteria from the live rock will spread to the dead rock, but there is so much more to a piece of high quality live rock then just the bacteria, all the micro and macro fauna, and flora on the live rock will not populate the dead rock, unless the live rock is allowed to live in a good ight source with the dead rock, and then it will take a very long time for the dead rock to be covered like the live rock, if you cover it, and due not use a good light source, most of the life on the live rock will die. One other thing, 2lbs of rock per gallon is way to much rock, especially with the dead rock people want to use, and all this super porous rock, makes for a big detritus trap, even with a massive amount of flow in your system. when diving on the reefs of South Florida and the Caribbean, the rocks I see are not nearly as porous as the dead rock most people use, that are mined from land and put in the ocean to seed. Again, another good article, keep up the good work. Last edited by Sk8r; 02/06/2017 at 09:34 AM. Really nice article Sk8r as usual. BTW, I am also using a marine pure block and it is working great, its really really porous and the surface area is huge to house the bacteria. It claims to remove nitrates as well, I am not too sure though, I have algae problems anyway. Last edited by Sk8r; 02/06/2017 at 09:31 AM. Would adding a light to the "tub" to encourage algae growth be a bad idea? Ecotech Radion XR15 Pro Gen3 x2, ReefLink, CPR CS50 Overflow. Reef Octopus NWB 110 Skimmer, Reef Octopus BR-110 Reactor. VorTech MP40 w/ QD Wetside x2, MP10 x1(Sump), 30-Gallon Sump. Current Tank Info: 60 Gallon, Prepping for LPS, 6 Years. Algae grows because of phosphate in the water or rock--nothing else likes phosphate. 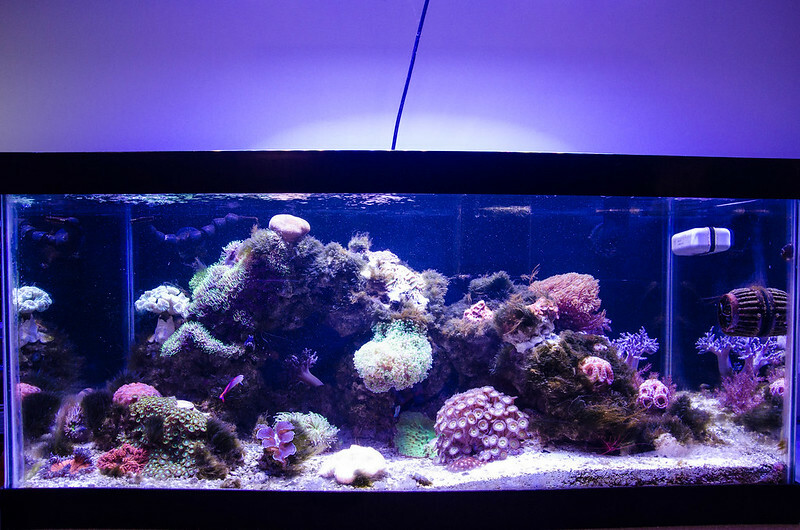 And it's one reason you always use ro/di water for your saltwater mix, so you don't have some coming in from tapwater. To discourage algae growth, keep the light out and run GFO to sop up the phosphate. I will try the GFO method for sure. But is it cost effective? GFO is not cheap. Neither is NoPoX. They CAN deal with the phosphate: GFO is phosphate-specific. NoPoX gets both nitrate and phosphate, and both work---but NoPoX requires a skimmer, which most rock-tubs don't have. A GFO doesn't need a skimmer. I will give it a try for now I guess, lets see how long the cure works. Thanks once more. Re "Be sure not using metal bearing stuff like volcanic thing", is rock from volcanic ash ok to use? I just bought 15 lbs of volcanic ash rocks that look like shelf plates from my local reef store. They have been cycling with my other 50lbs of dry rocks for over 2 weeks now. Should I be concerned of metal leaching? THere's a product called PolyFilter. Snip off a square of that and put it in the water. If it turns red, it's iron in the water; if blue, copper, etc. If it stays white, no metals. The good news is, it also binds what it identifies. I really want to avoid that on this tank, so I'm being probably extra cautious and could use some advice. Early December I bought 140lb of dry rock. I soaked it in bleach solution for a few days, let it dry out, then soaked in rodi water for a week. I let it dry out again, then stuck it in a brute can with new saltwater and a mag pump to keep it circulating and warm. It's been sitting in that brute for about 11 weeks now. Should I start feeding ammonia now and let it cycle while in the brute? Leave it alone and wait till it's in the tank? I'm still a few weeks away from having the tank empty and in place, so really wondering what my next move should be. Would you recommend getting real live rock to a beginner? I do mean live, as in Tampa Bay Saltwater's live rock, fresh out of the ocean. I live in the Tampa Bay area and it would be easy to purchase from them. I realize that there will be plenty of micro and macro life on these rocks and the potential for pests and I am just wondering if it would be too overwhelming to a beginner? I used about 80lbs live rock when i set up my 90g and that allowed me to have ALMOST no cycle. thats just my experience though and im still very new to the hobby myself so i would wait for someone whos more experienced answer. Pests can be dealt with if you seek advice from experienced reefers. Two varieties of worm (hermodice carunculata and eunicid) are a problem. Most crabs are problems. The rest of the life tends to be good. Your problems usually show up hunting food somewhere during the several weeks of cycle, and can be bottle-trapped and moved to the sump (where they're safe) or disposed of. Why not? Do some research set up your tank I say you will be just fine. I wish I had a source close to me I would love some fresh LR..
Tonga branch is very dense and would require 2 lbs per gallon. On the other end of the spectrum, Fiji pukani is very porous and sufficient surface area can be achieved by using less than 1 lb per gallon. I like to compensate by using medium sized aragonite sand which has more surface area than the rock itself.